How to… Eat healthily and spend less! 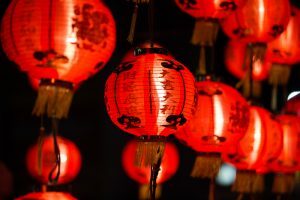 Chinese New Year falls on February 5th in 2019, and will be celebrated the world over. The 12 zodiac animals are: monkey, rooster, dog, pig, rat, ox, tiger, rabbit, dragon, snake, horse and sheep. 2019 is the Year of the Pig. The animal for the year you were born can allegedly determine your career, health and relationship success! Find your animal sign and its character traits here. Chinese New Year is also the Spring Festival. Although the weather remains wintery, the celebration marks the end of the coldest days. People welcome Spring and new beginnings. The Spring Festival originally involved ceremonies to pray to gods for a good harvest. (Agriculture is a vital industry in China). There are various versions of this story, but legend has it that a monster named Nian would appear every New Year’s Eve and attack villagers. Whilst most people would flee, one year a brave boy scared him off with firecrackers. The next day, people celebrated their survival by setting off firecrackers, and that tradition has remained a major part of New Year celebrations. Chinese New Year is celebrated by more than 20% of the world’s population. As well as mainland China, it is observed in many parts of Asia and in Chinatowns across the globe. Festivities vary, but most centre around family, fireworks and food. New Year is also a time to pay respects to ancestors, and to welcome good fortune for the coming year. The most important part of New Year is the family reunion, and as hundreds of millions of Chinese people head home for the celebrations, this causes the world’s largest human migration. 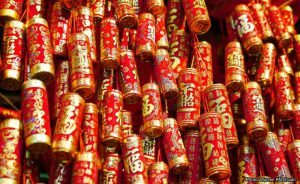 Chinese New Year’s Eve accounts for the largest use of fireworks on the planet. Fireworks are set off to welcome the New Year and bring good luck. Families also burn fake money to honour deceased loved ones. Most decorations are red (lanterns, paper, chilli peppers etc.) because in Chinese culture, red symbolises happiness, success and prosperity, and is believed to bring good luck and ward off evil spirits. Children are given lucky money in red envelopes or ‘packets’ (digital ones nowadays! ), to bring them good fortune and blessings. 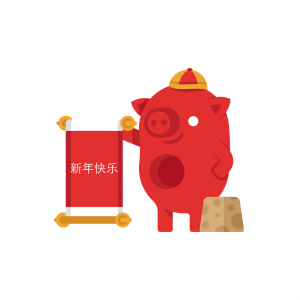 In China, you have your real (birth) age, and your nominal age, which increases with the Spring Festival. No showering, sweeping or throwing out rubbish! Before the Spring Festival, there’s a day of cleaning – to sweep away bad luck and make room for good luck. Then you’re not allowed to sweep or throw out rubbish until the 5th day, or shower on New Year’s Day, to make sure you don’t get rid of the good luck. Other New Year taboos include use of sharp objects (scissors, knives etc. ), breaking things, swearing, fighting or crying, and saying unlucky negative words such as ‘death’, ‘kill’ or ‘sick’.